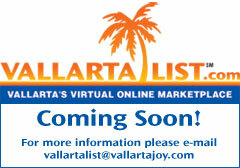 …Wondering how to find out who’s who and what’s going on in Nuevo Vallarta and the neighborhood? …Looking for bridge partner, golf, tennis or fishing buddies? …Looking for residents/neighbors with common interests, hobbies or people who might want to explore new restaurants etc? …Looking for a way to advertise your estate or ”garage” sale or other items for sale? …Looking for volunteer opportunities or want to volunteer? …Selling your vacation home and need more exposure? …Need reputable service contractors to help with repairs/remodeling/etc. at your vacation condo or villa? …Looking for cultural, arts, music and other events happening in Vallarta (especially in Nuevo Vallarta)? VALLARTALIST IS YOUR BEST RESOURCE! WE WILL BE THE NEIGHBORHOOD MOUTHPIECE, NEIGHBORHOOD “BULLETIN BOARD”, VIRTUAL MARKETPLACE AND INFORMATION SOURCE FOR OWNERS, VACATIONERS, YEAR ROUND RESIDENTS AND ANYONE INTERESTED IN NUEVO VALLARTA HAPPENINGS. CHECK OUT FREE AND PAID ADVERTISEMENTS IN VALLARTALIST SM FOR ALL THESE NEEDS.